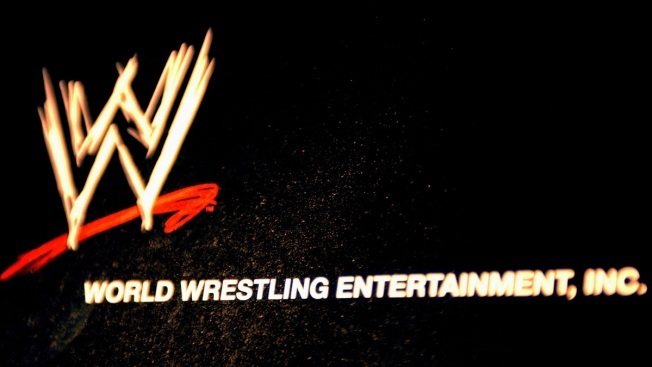 This March 18, 2003, file photo shows the World Wrestling Entertainment logo hanging on a wall at a media conference at ESPN Zone in Times Square in New York City. Former professional wrestling champion "Luscious" Johnny Valiant has died after being struck crossing a street in a Pittsburgh suburb. The Allegheny County medical examiner says in a statement that 71-year-old Thomas Sullivan died Wednesday morning at a hospital. He was struck just before 5:30 a.m. while crossing a street in Ross Township, about 8 miles (12 kilometers) northwest of Pittsburgh.